So we set off. As we could see the mountain in front of us, we kept heading straight, missing the turn the hotel had suggested we take. However, there's still a path up, and even though it's unpaved we decide to give it a try. The walk up is reasonably easy, if a little steep in places, but generally not muddy, which had been our original concern. However, we were wondering if we'd taken on a little too much, when suddenly we rounded a corner and found ourselves at the summit. Of course we then realised that there's a car park and we could have come the whole way by road, but that wouldn't have given us nearly the same sense of achievement. 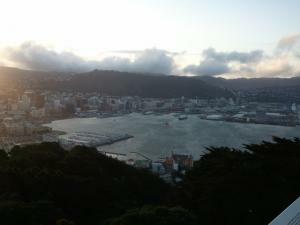 Unfortunately, there was still a mist over the whole of Wellington, so we couldn't really see any of the city. But by a strange coincidence, we bumped into a couple of New Zealanders, including a woman who'd written a couple of childrens' books on the Antarctic and was looking for the Byrd memorial. We helped her to find this, but during the course of the conversation, Jonathan found out that she'd worked in Cambridge University, where his book is published, and knew some of the same academics he knows. They very kindly gave us a lift to the city, saving us from the walk back down. The other place we were interested in seeing was the Carter Observatory, which had been closed when I got there the day before. So we took the cable car back up, and made our way into the observatory. We had about ten minutes before the planetarium showing, which was ideal to take a browse the rest of the exhibition area. The planetarium show was a movie about life as an astronaut projected onto the domed ceiling. It was quite good, despite being aimed at kids. This was followed by a presentation by one of the observatory astronomers of the southern sky. I was particularly interested in the stars that can't be seen from the northern hemisphere. When it ended we got chatting with the presenter, and told him about the convention. Although the committee had made a booking for a visit on Saturday night, they hadn't actually told them about the convention, so he put it on the observatory website and said he might pop in over the weekend. We spent a bit more time in the observatory, browsing the exhibits (thought nearly missing the fact that we could get up the stairs to the telescope), and finally picking up a few things in the shop. We then took a bit of a walk around the Botanic gardens before catching the cable car back down. We noted that the weather had cleared up, and that it might be worth a second attempt at Mt Victoria, but decided to go back to the hotel first. At the hotel we met up with other fans, and I got chatting with Kurt from Texas while Jonathan went to his room. We talked about fandom in general and other people drifted in and out of the conversation. As we were getting comfortable, and towards the later end of the afternoon, seeing the view from Mt Vic was starting to look unlikely, until I suggested that as there was a road all the way to the top, a taxi up probably wouldn't be very expensive. Kurt decided to join us, and we managed to find a taxi. Reaching the "lookout" just before sunset was a really nice time to be there, with the sun setting over the city. On a good day you can see the south island, but while we could see some darkening on the horizon, it was a little too foggy to claim we could see south island. Satisfied that we'd seen it, we hopped back in our taxi and headed back to the hotel. I received a text message from Rod telling me that he'd found a good pub, so we rounded up a group and headed to join him. A jug of beer later, we crossed the road to the Welsh Dragon, which claims to be the only Welsh pub in the southern hemisphere. It also appeared to have been built in a former public convenience. We ordered another jug of beer, and then discovered that a couple of our party didn't drink, and were getting rather hungry, and we seemed to have found the only pub in Wellington that didn't serve food. So Kurt and John from Texas, C.P. from Texas and Minnesota, and Cathy form Minnesota formed the advance party and went to find us a restaurant while Johathan, Rod, Urban and I finished our jug, and a second as we needed to be sure about the quality. We caught up in an Italian restaurant. They had already ordered, so we quickly ordered for ourselves, and our food didn't arrive too long after the advance party's. Again, it was quite excellent. Wellington has a fantastic selection of restaurants compressed into a very small area. After a very enjoyable dinner, we ended up back at the convention hotel, and decided to sample some of the beers available there, which pleasantly finished off the evening. It was rapidly approaching 11pm, when the last buses run, and I needed to pack to be ready to head in the following morning, so I said my farewells and headed back to the suburbs for a final night. Submitted by Jim (not verified) on 4 September, 2010 - 01:20. I'm sure Patagonia must have some Welsh pubs. Well there's a lot of people with Welsh ancestry and I'm sure some of them must drink. Submitted by メンズ腕時計 (not verified) on 14 March, 2014 - 04:12. Submitted by Jameskilley (not verified) on 9 March, 2017 - 15:49. Jonathan is a very popular place to many of the people who would like to have the fun and joys. This restaurant has been serving a high quality foods to their customer.They may visit here http://www.rushmyessays.com.au/ to learn more details about the available food items in the restaurants. Submitted by Tracey (not verified) on 13 March, 2017 - 12:44. The summer season is the best time to climb the mountain. June can be somewhat early relying upon the climate conditions, yet at the same time conceivable. Sept is a decent time to climb UaeAssignmentWriting.help. Make sure to hold your spot at the Hut as it can top off quick amid pinnacle climbing periods. Submitted by bse odhisa 10th result 2017 (not verified) on 20 April, 2017 - 06:27. Submitted by cbseresults.nic.in (not verified) on 17 May, 2017 - 04:00. Submitted by WWW.mahresult.nic.in (not verified) on 12 June, 2017 - 04:01. Submitted by Felicity Fencing (not verified) on 11 September, 2017 - 14:23. Submitted by bruno99 (not verified) on 14 December, 2017 - 08:01. You can Get Dream league Soccer coin Hack Online from dlshack.com without downloading any file or something.